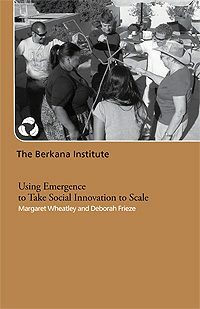 Meg Wheatley and Deborah Frieze co-authored this article about the role of emergence in taking social innovation to scale. Here is an excerpt. Because emergence only happens through connections, Berkana has developed a four-stage model that catalyzes connections as the means to achieve global level change: Name, Connect, Nourish, Illuminate. We focus on discovering pioneering efforts and naming them as such. We then connect these efforts to other similar work globally. We nourish this network in many ways, but most essentially through creating opportunities for learning and sharing experiences and shifting into communities of practice. We also illuminate these pioneering efforts so that many more people will learn from them. We are attempting to work intentionally with emergence so that small, local efforts can become a global force for change.